Eucalyptus Deluxe Stacking Arm Chair with Olefin Cushion, 4pk. 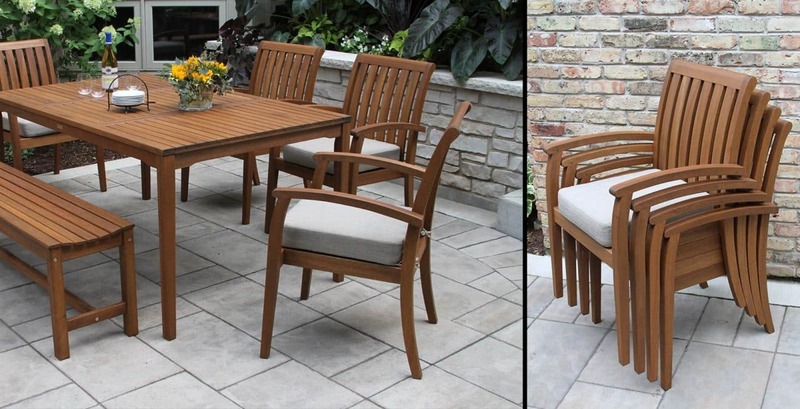 The Outdoor Interiors Eucalyptus Deluxe Stacking Arm Chair with Olefin Cushion provides elegance, comfort and pairs well with many tables. This Deluxe Stacking Arm Chair is made from sustainable, plantation grown Brazilian eucalyptus hardwood for long lasting outdoor use and durability and is finished with a beautiful brown umber stain. These chairs are the most durable and stable in our product line. The quality weather resistant Olefin fabric cushions are mildew resistant, quick drying & provides excellent water repellency. The 4 pack ships in one carton, fully assembled and also stacks for storage! If the fabrics becomes soiled, use a mild soap mixed with water and a soft rag or brush to clean. Do not get the oil on the cushions. 20505 - Deluxe Stacking Arm Chair with Olefin Cushion, 4pk.